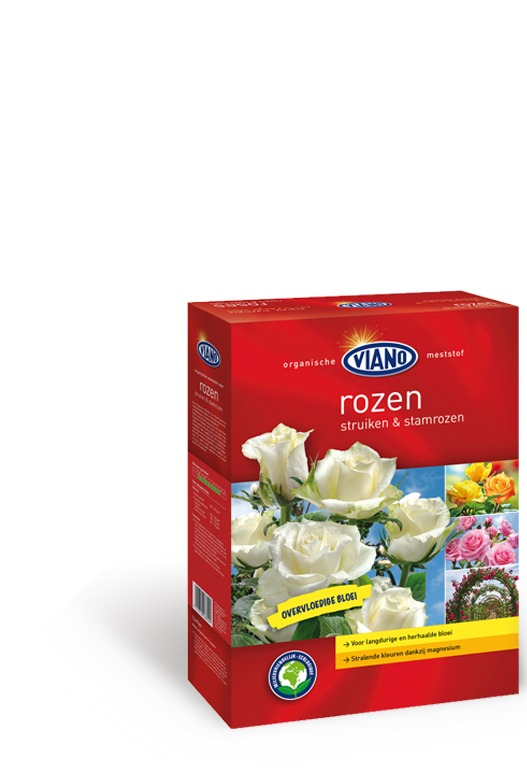 Viano Rose food is the ideal fertiliser for shrub-­ and climbing rose, rosebushes and standard (cutting-­ )roses. Contains a high potash content to increase flowering and flower bud formation. With extra magnesium for bright colours. Soft acting fertiliser that guarantees a longer preservation after cutting. Works up to 3 months. This organo-­ mineral premium fertiliser imcreases the humus content in the soil and improves soilstructure and micro-­ life. 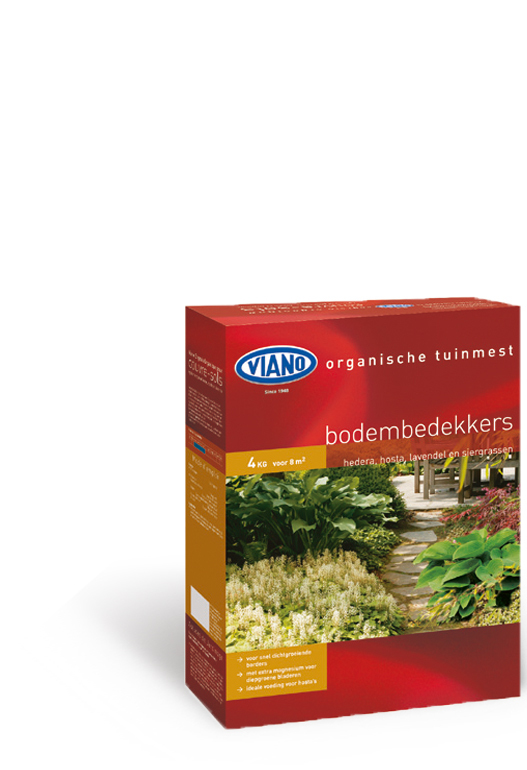 Viano Rhododendron and azalea food is an organo-­‐ mineral fertiliser in crumbs. Enriched with magnesium for bright colours. 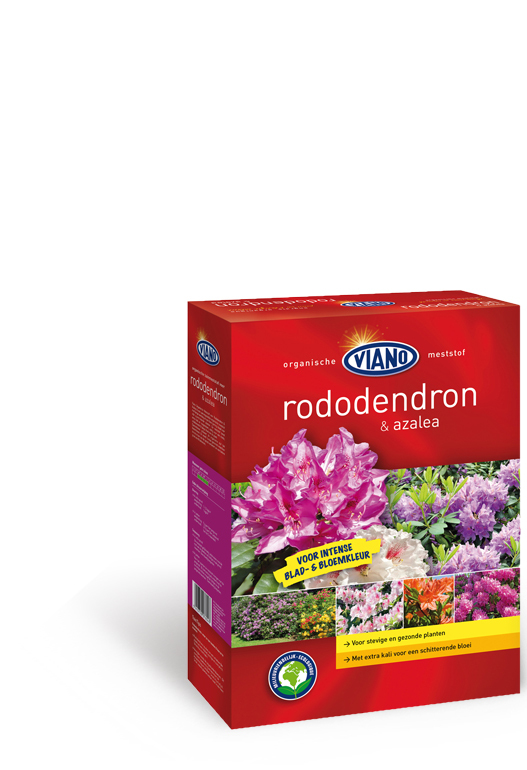 Due to the presence of a high potash concentration, this soft & acid working fertiliser ensures abondant flowering and an extended preservation of the flowers after cutting.. Viano Rhododendron and Azalea food can be used as a pH corrector in soils with to much calcium. Works up to 3 months. Can be applied on soils with to high calcium (Ca)concentrations were it will lower the pH. An organo-­ mineral fertiliser with magnesium that prevents the prematural shute of needles and brown colouring of leaves in conifers, taxus and evergreen shrubs. With extra magnesium for bright green colours. This fertiliser contains extra potassium to guarantees strong and healthy plants! 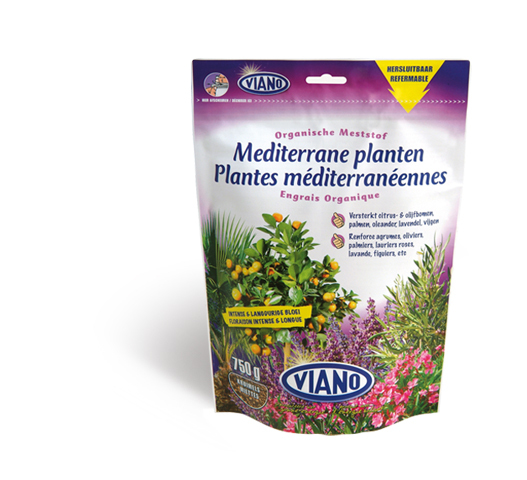 Viano fertiliser for conifers and Taxus improves humus content in the soil and works up to 2 months. This fertiliser can be appllied during the whole growing season and assures a better soil structure and soil life. Incorporate superficially to get the best results. 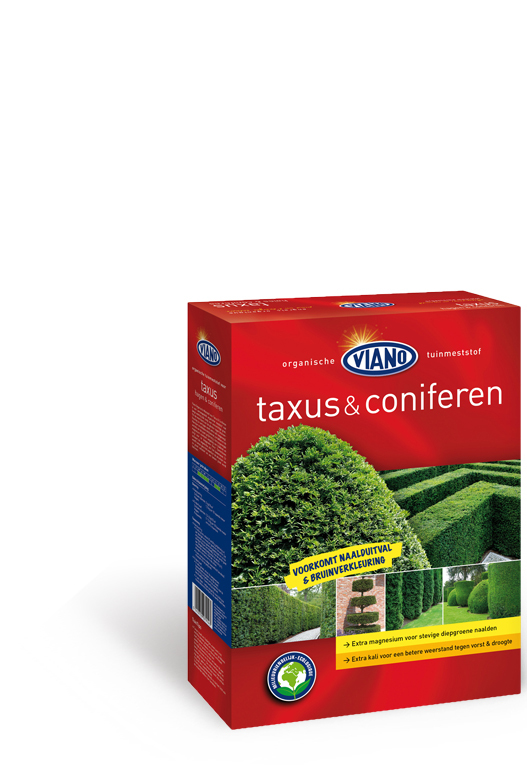 An organo-­ mineral NPK fertiliser with magnesium for deep green coloUrs. This slow and soft acting fertiliser (up to 3 months) improves soil structure due to the organic components . 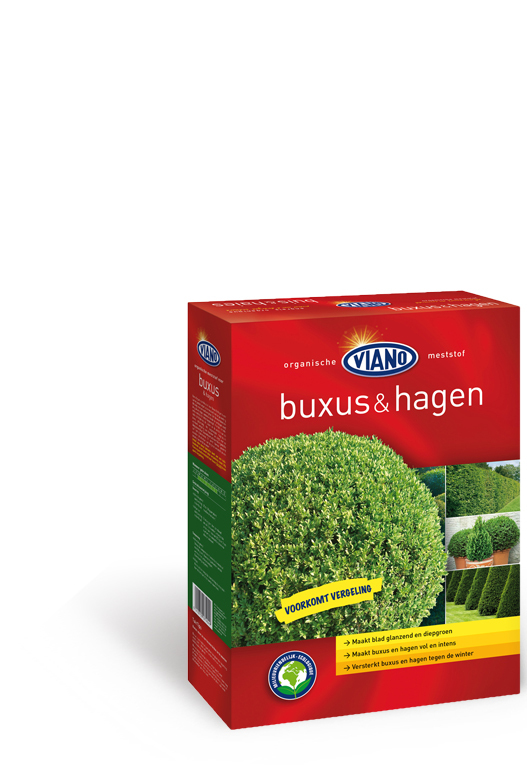 Guarantees strong and healthy plants with a higher resistance against drought and frost.Viano Boxwood plantfood can be used for Boxwood in full ground or in pots and container. A organo-­ minEral fertiliser specially composed for fertilisation of ornamental leafplants and soilcovering plants in the garden. Soft acting fertiliser that improves humus content in the soil. With extra magnesium for bright coloUrs. Can be applied for shadowplants. Works up to 3 months and gives soil covering plants all they need for a healthy development. This fertiliser can be applied while planting or during maintenance in full ground or in cointainer. 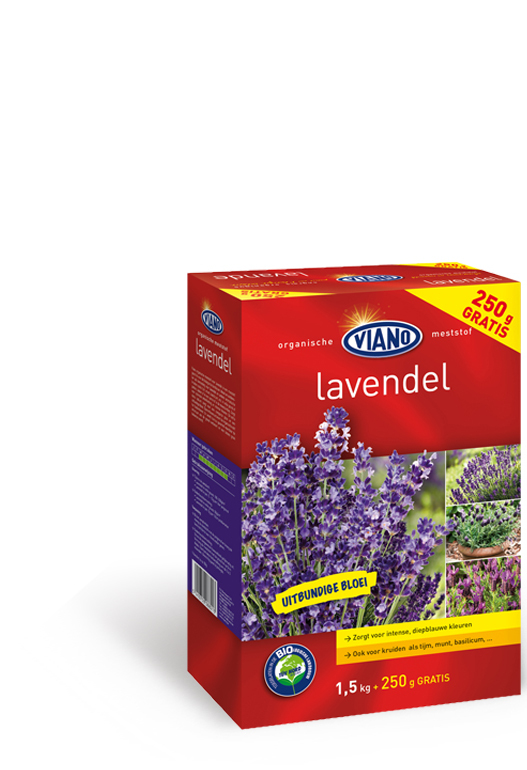 Viano lavender food is the ideal fertiliser lavender and other aromatic (herb) plants. Contains a high potash content to increase flowering and flower bud formation. With extra magnesium for bright colours . Soft acting fertiliser that guarantees a longer preservation after cutting. Works up to 3 months. This organic premium fertiliser imcreases the humus content in the soil and improves soilstructure and micro- life. 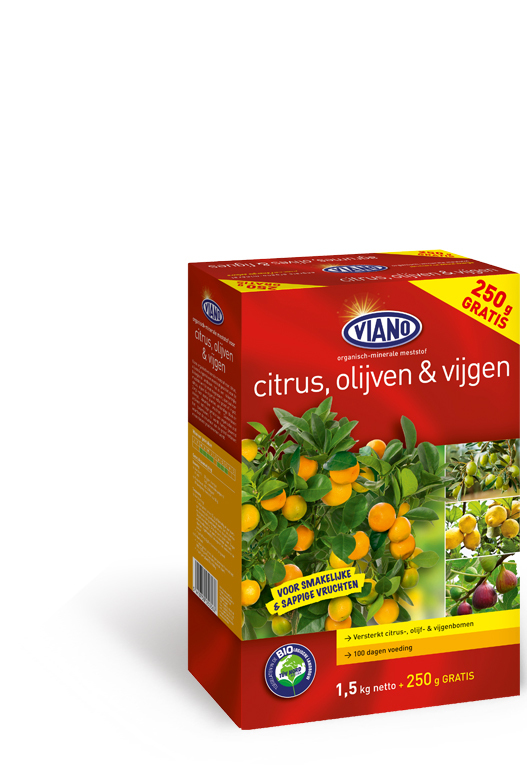 Viano organic food for citrus, olives and figues is an natural fertilizer for the fertilisation in container or in open soil. The high potash content ensures a increased formation of flower buds, more fruits, strong and healthy fruits with a longer preservation time after harvesting. With Viano organic food for citrus, olives and figues , fruits become more tasty. This fertiliser can be applied during plantation or as a stock fertiliser during growing season. Works up to 2 months. 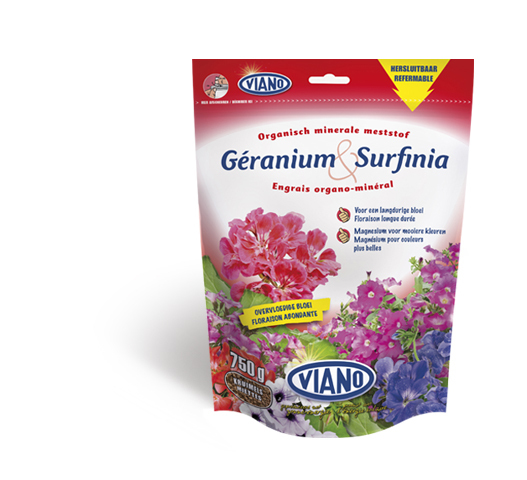 Viano Geranium and Surfinia fertiliser is the ideal feed and contains a high potash content to increase flowering and florwer bud formation. With extra magnesium for bright colours . Soft acting fertiliser that guarantees a longer preservation. Works up to 2 months. This organo- mineral premium fertiliser imcreases the humus content in the soil and improves soilstructure and micro- life. 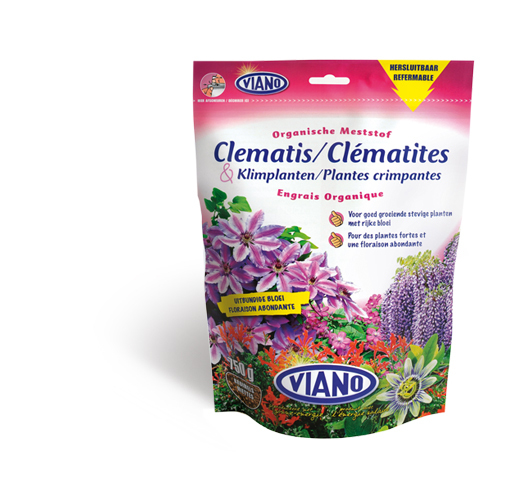 Viano Clematis food is the ideal fertiliser for Clematis and other climbing plants. 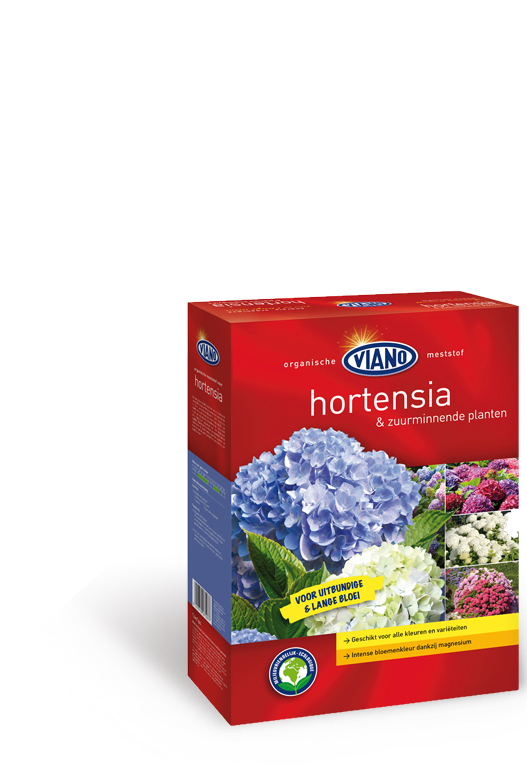 Contains a high potash content to increase flowering and florwer bud formation. With extra magnesium for bright colours . Soft acting fertiliser that guarantees a longer preservation. Works up to 2 months. This organo- mineral premium fertiliser imcreases the humus content in the soil and improves soilstructure and micro- life. Organic- mineral fertiliser specially for the fertilisation of flowering shrubs, flowerbeds and ornamental garden plants. With extra magnesium for vivid colours. This fertiliser guarantees a long working period (up to 3 months) . 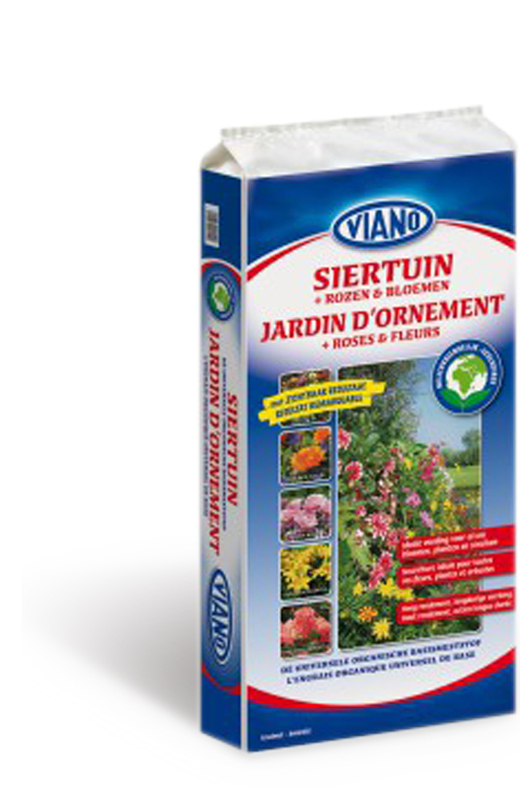 Due to the specific composition,Viano fertiliser for flowerbeds and flowers ameliorates the soil structure and enhances soil life. Due to the high potash content a better flowerbud development and a abundant flowering can be expected. Organic based fertiliser specially for the fertilisation of flowering shrubs, flowerbeds and ornamental garden plants. With extra magnesium for vivid colours. This fertiliser guarantees a long working period (up to 3 months). 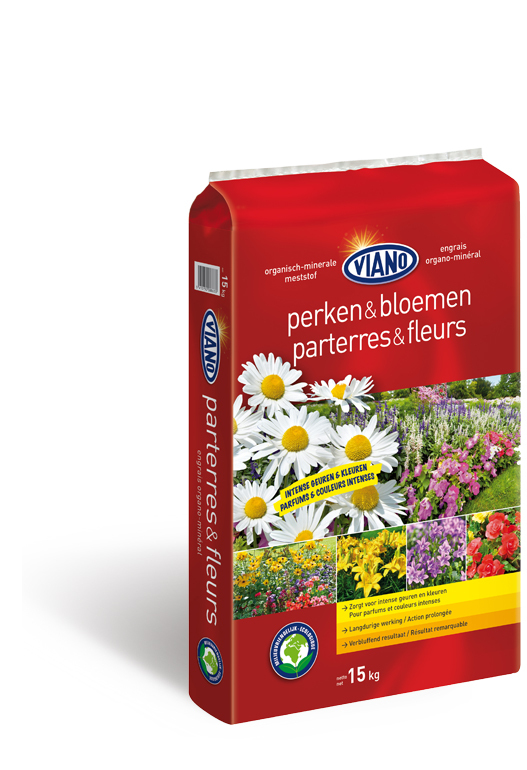 Due to the specific composition, Viano fertiliser for flowerbeds and flowers ameliorates the soil structure and enhances soil life. Due to the high potash content a better flowerbud development and a abundant flowering can be expected. An organic fertiliser for general use in ornamental, kitchen, herb- fruitcrops and vegetable garden, ornamental garden and lawn. It is authorized for use in organic farming and guarantees a long and soft action period (3 months).. It offers the plant a wide range of essential nutrients, activates soil lif and improves soil structure. A real booster for any crop. Can be generally applied from spring till autumn but gives the very best results when applied in fruitforming vegetables and fruit garden. 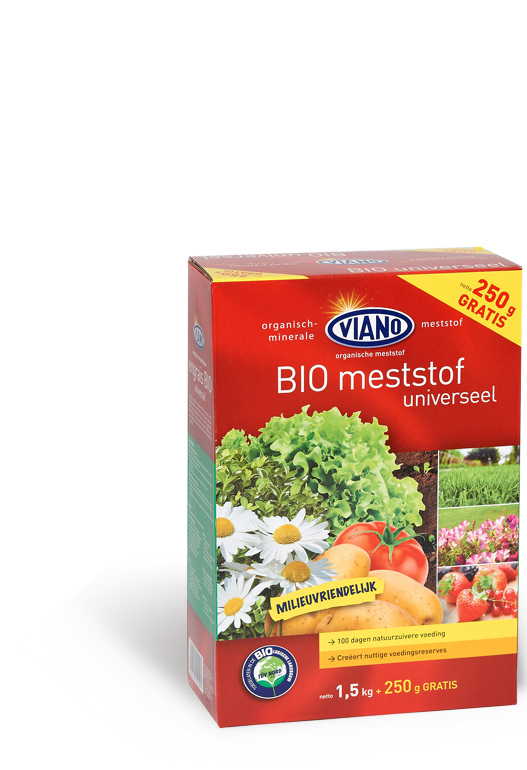 Viano Universal bio fertliser is to incorporate before planting or to use as a maintenance fertiliser during growing season. 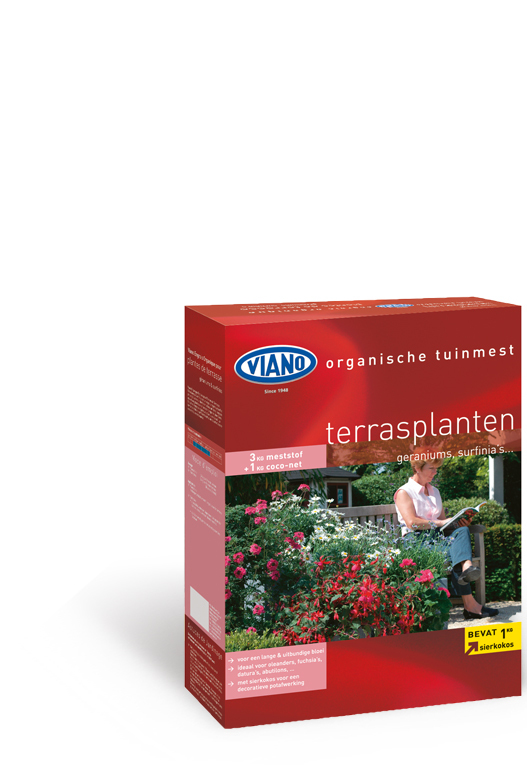 RHS endorses organic based lawncare products from Viano! Our website uses so-called 'cookies'. Cookies are small data or text files that are installed on your computer or mobile device when you visit a website or use a (mobile) application. Cookie files contain unique codes that, for example, allow your browser to recognize you during your visit to the website. Necessary functional cookies are cookies that are necessary to use our online services in a good way. Because these cookies are necessary for the website to function properly, you can not refuse them without affecting the functioning of the website. You can block or delete cookies by changing your browser settings and blocking all cookies on this website. Google Analytics Cookies collect general information about the way our website is used. We can make statistical analyzes of the information we receive in this way. How did you end up on our web page? On which page do you spend most of the time? Thanks to statistical results, we can make the structure, navigation and content of our website as user-friendly as possible and improve. No permission is required for the use of these cookies and they can not be deactivated. We also use various external services such as Google Webfonts, Google Maps and external video providers. Since these providers can collect personal information, such as your IP address, you can block it here. Please note that this can greatly reduce the functionality and appearance of our site. Changes take effect as soon as you reload the page.